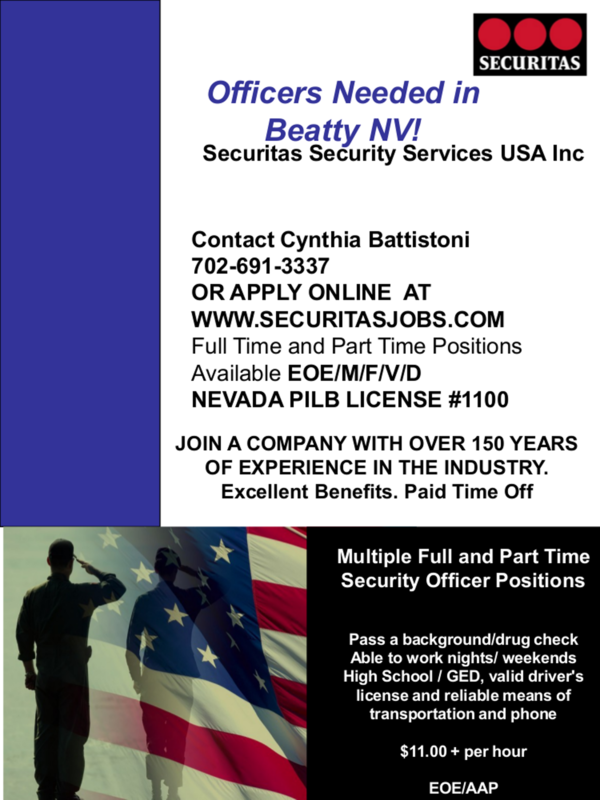 Looking for Work in the Beatty area? Below are some links to Government job search engines and local employment opportunities. BUSINESSES: Do you have a position to list? Please Email the Chamber with your listing. Now hiring full and part time sandwich artists. Please apply in person a the Subway inside the Nut & Candy Store. Ask to speak to either the manager Jessica or the assistant manager Russell. High school students encouraged to apply. EMTs in Death Valley National Park. To qualify, applicants must have certification as an Emergency Medical Technician (EMT) Basic through the National Registry of Emergency Technicians (NREMT). Note that applications must be submitted online by April 22. Death Valley is anticipating hiring two people. Please note that the jobs are advertised two ways: 1) open to all US Citizens and 2) open only to US citizens who have lived in Death Valley NP, Furnace Creek, Shoshone, Beatty, Armagosa Valley or Darwin for at least 2 years. These are term positions (initial appoint of up to 13 months can be extended up to 4 years), includes a retirement account similar to a 401-K with up to 5% match, base salary of $32,318/year, and building time federal retirement (cumulative minimum of 5 years required to earn pension). Who may apply: Excepted Service, contiguous area of Death Valley National Park (US citizens with 2 years of residency in Death Valley National Park, Furnace Creek, CA; Shoshone, CA; Beatty, NV; Amargosa Valley, NV; or Darwin, CA). 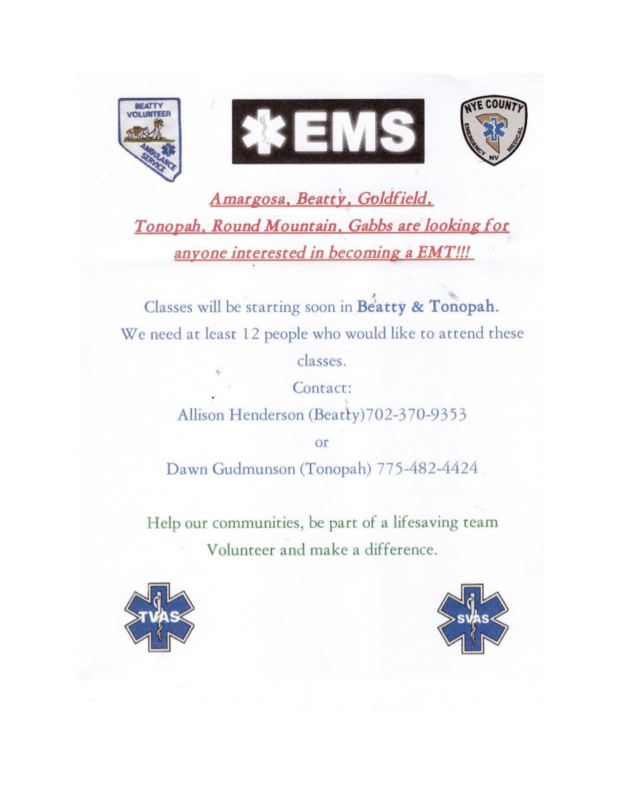 Do you live in Pahrump ro Amargosa Valley? Is Beatty too far away? We are willing to compensate. Nye County Employment: Nye County Human Resources page has links to application forms. Beginning September 5, 2006, the Department of Personnel began accepting on-line employment applications. This system allows you to conveniently search and apply for job openings on-line, store applicant profile information and submit applications electronically. No more time consuming paper applications or trips to the post office to mail an application. The system also allows for position vacancies to be announced on a daily basis. NDOT has some entry level positions that are on a continuous recruitment list. This means that there are OFTEN openings in these classifications. The minimum qualifications for Highway Maintenance Worker I requires one year of experience as a general laborer or semi-skilled worker that demonstrates an ability and dexterity to operate tools and equipment. Highway Maintenance Worker II requires one year of experience performing basic highway maintenance work equivalent to a Highway Maintenance Worker I; OR two years of experience as a general laborer or semi-skilled worker, one year of which was performing a wide variety of highway maintenance activities.License: A valid driver’s license is required at the time of appointment. A Class A or B commercial driver’s license may be required within six months of appointment or at time of appointment if the applicant is required to operate a commercial vehicle or transport hazardous material to perform the duties of the position. Highway Construction Aid positions are typically used for seasonal overflow work on Highway Construction or Maintenance Crews, Materials Labs or Equipment Shops. They can also be used to provide back-up clerical assistance. The Highway Construction Aid is a temporary position (up to 6 months duration). The minimum qualifications require the ability to read, write, follow verbal or written instructions and operate common tools and equipment. Some positions on winter highway maintenance crews may require a Class A or B commercial driver’s license. Above all, be sure you read the entire announcement packet to be sure "where, when, what and how". Many positions require that additional forms be included with your application, or have special submission requirements. Nearly all announcements include a number of KSA (Knowledge, Skills, and Abilities) statements that must be addressed to complete your application. Incomplete applications may not be reviewed. Some applications are actually mailed to a different park to avoid any asumption of favoritism. If you need an application packet, and do not have access to the net, stop by the Chamber office to pick one up. For most positions in the park you must mail your application so it will be postmarked by the closing date and received within five (5) working days of that date. If hand delivered, be sure your application is received by closing date. You are encouraged to use the USAJOBS resume builder to speed the application process. If you are not applying on line, be sure your application includes the following: A resume or an Optional Application for Federal Employment (OF 612) or any other format. Although there is not a specific format required, you should read the entire announcement packet to determine the type of information and what forms may be required for each position. 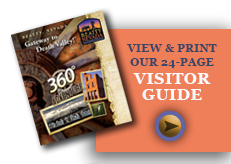 The Death Valley Jobs Website lists all current openings with instructions on how to apply. Nevada Department of Personnel: This site lists current job openings in several different formats. Employment Information: links to information about working in state and national parks. Current Openings: see site for information about current openings and for hiring seasons for our area. USA JOBS A prime source for Federal employment across the nation. Easy to set up with location, agency, and keyword searches, as well as email notifications and a virtual Resume. Current Openings: Many; various occupations. AVUE is used primarily by the US Forest Service, though other organizations may use this online Job Bank as well. There is an automated application system. Initial set-up of your virtual resume is time consuming, but well worth the effort when you begin applying for positions.